Through a torrent text exchange between my brother and I, it was confirmed that our family departure time, pending any paternal hiccups, we would arrive in Mexico in time to catch the Diamond Head Classic championship game. This was good news. Certainly good news on the heels of a delayed turned cancelled turned next-day-departure travel saga. We arrived at our desolate and cozy fishing village – a destination we’ve frequented for twenty-one consecutive New Years – with ample time to unpack, jog on the sunset bathed beach, and secure a couple cold ones. 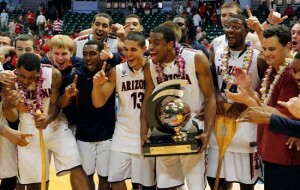 Then the hunt for Arizona-Red December began. 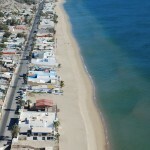 Bahia de Kino, Sonora, Mexico. It started at La Palapa, the same bar/restaurant we took in such contests as the Arizona @ UW Roy V. Adams battle, the 1997 Holiday Bowl, and other opening Pac weekend games. With me driving, baby brother ran in with his slighty-better-than-functional Spanish only to discover they’d cancelled their Dish subscription. And had no black box. Onto the next, blowing right past La Margarita where we watched the 2010 Holiday Bowl and which had since went under, to check game availability at La Casa Blanca. We’d yet to take in a ‘Cats game at this venue, ever, and the blackened windows and blacked out patio bar led us to believe – despite my brother’s investigative lap – we wouldn’t soon be catching ESPN2 at this establishment. Our third stop was Jorge’s, the last bar on the single lane strip of highway along the beach with a glorious pelican mural on its southern-most wall. Brother again ran in only to find they had limited television access despite a glamorous flat screen adorning the inside of that very muraled wall. We had now, at this point, exhausted our known and possible viewing establishments. To use the colloquial term: Tuvimos un problema. Which is right about the moment my cousin, Michael, spoke up. This young lad is in college, one’s prime years of thriftiness, and had recently returned from time abroad. A semester in which the young man became savvy with regards to – we’ll call it accessing – any broadcast his heart desired. And so, with the matter of factness displayed by an expert attorney delivering a closing argument, Michael informed us of his skill. Whilst skeptical, we were desperate, and took the youngin’ up on his offer. After all, we’d surveyed our choices and the only remaining option was a spotty-at-best AM radio feed. Michael’s idea was a success. We hovered around a 15-inch Mac screen, a floating group of eight; a dedicated group of three. The shoddy feed added to the drama of an already tense top-20 matchup. Of course the game’s biggest moments commanded the biggest crowd (we’d grown to eight by then) and at that point we were relegated to a business card-sized viewing, having long given up on full-screen mode’s ability to deliver any continuity of picture. That’s to say, we’d reached our limit on shots that would freeze mid-flight for 2-to-8 seconds only to reemerge as a five-point swing the other way! And so, on the edge of my bar stool and with only the slightest bit of conscientiousness for my dad’s second row seat, I watched that business card as Mark Lyons drew a foul and knocked down both free throws. Tapley received the hand off and dribbled to the top of the key. The screen came and Nick Johnson was seemingly eliminated (FORESHADOWING!) from the equation. Brandon Ashley slid off of his defender to cut Tapley off as if he were a Spanish bullfighter. Ole! And so there it was: A lane more open than a taco shop for Chase Tapley to knock off the third ranked team in the country and maintain SDSU’s strangel-hold on west coast collegiate hoops. With his dribble up he began to elevate for the game winner. Tapley would later admit he went up too slow. I concurrently admitted the game stream was miserably slow. But Nick Johnson, aboard a chartered flight, arrived to send the Aztec layup away and into the secure arms of Kevin Parrom. The buzzer sounded. The computer froze. We looked about this content. Such was the beginning to my New Years celebrations; a Wildcat victory and my mother’s birthday at our annual Christmas-to-New Years break in Mexico. Mom smiled with little understanding beyond the fact that Arizona outscoring San Diego State excited her boys. Perhaps that was enough for her, parenthood is a love I have yet to personally comprehend, though I do appreciate it. and who perhaps you irritate beyond rational explanation of cause. And if you can’t? Well, there’s always midnight.